The traditional sender-based message logging protocols use a garbage collection algorithm to result in a large number of additional messages and forced checkpoints. So, in our previous work, an algorithm was introduced to allow each process to autonomously remove useless log information in its volatile storage by piggybacking only some additional information without requiring any extra message and forced checkpoint. However, even after a process has executed the algorithm, its storage buffer may still be overloaded in some communication and checkpointing patterns. 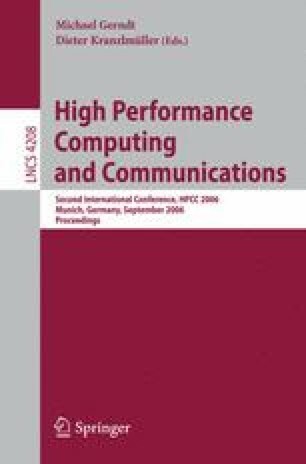 This paper proposes a new garbage collection algorithm CCPNA for sender-based message logging to address all the problems mentioned above. The algorithm considerably reduces the number of processes to participate in the garbage collection by using the size of the log information of each process. Thus, CCPNA incurs more additional messages and forced checkpoints than our previous algorithm. However, it can avoid the risk of overloading the storage buffers regardless of the specific checkpointing and communication patterns. Also, CCPNA reduces the number of additional messages and forced checkpoints compared with the traditional algorithm.